Second chances are rare in the tech world. Unless you're one of the big boys -- say a Samsung or an Apple -- one spectacular failure is enough to doom a product line or even an entire company. Just ask Gizmondo, 3D Realms, Helio, Palm, Netscape, DivX, Sega... the list goes on and on. All it takes is one mistake and a hyped device or marquee company can end up as little more than a nostalgic Wikipedia entry. 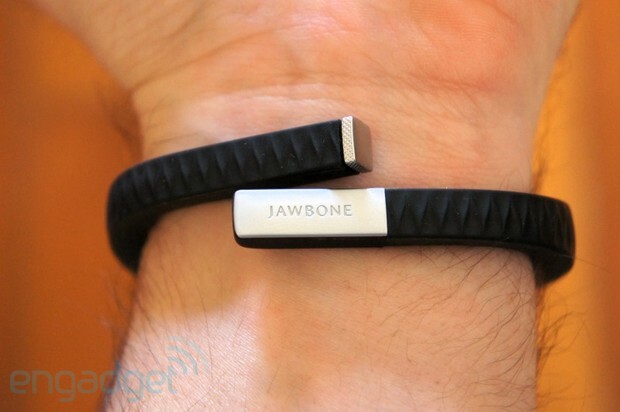 After last year's debacle with the Up, we thought Jawbone might give up on the fitness market entirely. In case you missed the drama last holiday season, here's a quick recap: within weeks of launching, the Yves Behar-designed motion-tracking bracelet simply stopped working for many customers. We even had two units fail during the course of writing our original review. It quickly became apparent that the problems were not just widespread, but near ubiquitous. 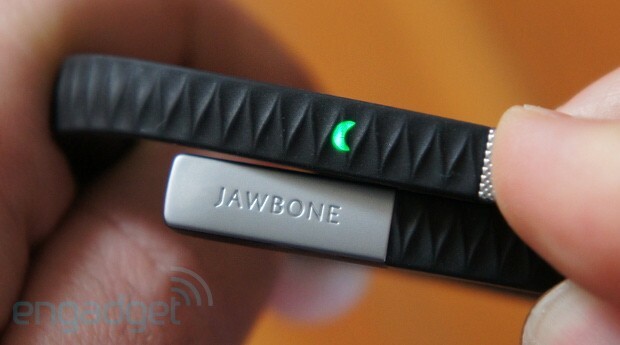 Up was pulled from the shelves, customers were issued refunds and Jawbone went back to the drawing board. We have to hand it to the company for quickly taking ownership of the problem and cutting checks to the unfortunate souls who ponied up $100 to buy one. But, while seeing a company readily admit failure was a pleasant surprise, we were even more shocked when Jawbone didn't simply cancel Up entirely and cut its losses. Instead it tracked down the root issues -- water permeability, flexibility and a barebones app -- and redesigned the bracelet from the ground up. The basic functionality and aesthetic choices are the same, but the materials, the iOS data logger and actual internal assembly are all completely different. Unfortunately, all these upgrades mean last year's $100 bust is this year's $130 shot at redemption. And the real question is, even if it works, is the Up something you'll want or need? Jawbone has addressed many of the issues that plagued the original Up, but $130 is a steep asking price for a stylish pedometer and mediocre health-tracking app. How would you rate the UP (2012)? Behar played it pretty safe with the design of the Up. From close up it's pretty clear it's not just a fashion accessory, but no one is going to point and stare at it from across the street. It's downright subtle when compared to the LED-riddled (and overpriced) Nike+ FuelBand. It's got the same zigzag pattern across the top as the original, an aesthetic choice that's a little too reminiscent of a bad tribal tattoo for this reviewer's tastes. (One person asked if it was meant to prevent sea sickness.) What is problematic is the textured button on one end and the cap covering the 3.5mm plug on the other. They constantly got in the way, catching on things and scraping against the palm rests of our laptops. The rubberized body is clearly supposed to be inconspicuous, but we constantly had to turn the bracelet around so the Jawbone-branded cap and button were facing outwards, giving away its non-decorative function. We had to turn the bracelet around so the branded cap and button faced outwards, giving away its non-decorative function. Last year's model was built to be "rugged" according to certain industry standards. The new Up goes well beyond those measurements, and that's good since underneath the rubber exterior are some rather delicate electronics. Gone are the issues with warm water and soap seeping in or its tendency to break apart internally when bent. We've showered with it, washed dishes, scrubbed floors, yanked it roughly off our wrists and needlessly bent it back and forth just out of boredom. Weeks later, it's still ticking. Jawbone even built special machines like the Big Shower 2000 to put its durability to the test before shipping. Sadly, the more things change, the more they stay same. There's still no Bluetooth or other wireless syncing option (point Fitbit), nor is there a micro-USB port for charging. Instead you'll still have to rely on the repurposed headphone jack for both these tasks. So yes, that means you'll have to plug the band into your iPhone or iPad every time you want to upload your steps or change your settings. Though, you might not want to bother with the iPad since the app doesn't scale natively. It also means you'll need to keep close tabs on the cap and proprietary charging cable, both of which we've come dangerously close to losing more than once in the last few weeks. On the plus side, if you did lose the charger, you'd have plenty of time to order a new one and have it shipped to you; Jawbone claims the Up has a battery life of 10 days. And the company is pretty darn close: we were able to go nine days before our review unit finally demanded that we plug it into our computer's USB port. The other major complaint leveled against the original Up was that its companion app was rather lackluster. The software, currently compatible with iOS devices only, is an essential part of the data-tracking package -- without it the Up is little more than a piece of plastic jewelry. Thankfully Jawbone buckled down and polished up the app. 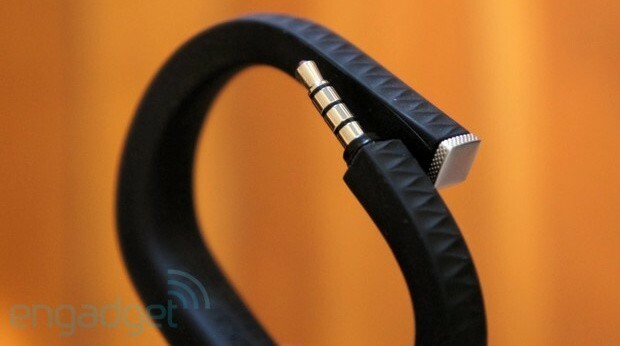 In fact, whereas last year it felt like an afterthought, now the bracelet seems like an accessory to the app. Many of the major aesthetic elements have returned, but there's a fresh coat of paint, a more modern layout and, most importantly, tons of new features. The social aspects serve two purposes -- to motivate you through a sense of companionship and competition, and to shame you through public humiliation. The "Me" page is now the home screen and there have been some minor tweaks to the design. It still uses bars to represent your progress towards sleep, step and food goals, but you can now scroll down through the day's updates -- including any exercise or meals you and your friends "teammates" have entered. In addition to presenting you with more information and context up front, the new home screen also more readily exposes the app's social features. If you want to comment on your own or a teammate's progress all you have to do is tap on the tiny speech bubble at the bottom of each update card. Making the social aspects more visible serves two purposes -- to motivate you through a sense of companionship and competition, and to shame you through public humiliation. Though Jawbone and most other fitness-tracking services will deny that shaming is an intentional component of their products, there's no ignoring reality. Publicly confessing that you just ate a 1,400-calorie Chocolate Chip Cookie Dough Blizzard from Dairy Queen at 11 AM on a Wednesday is probably the best way to ensure you never do it again. Similarly, seeing your calories pile up in a public forum will make you more conscious of what you put in your body. If you're more concerned with putting all that data in context, you can simply tap the back and forward buttons to browse through your history. You can see a more direct comparison however by exposing the left-hand menu bar (either by swiping right or by tapping the menu icon in the top-left corner) and viewing your Lifeline or Trends. Lifeline simply plots your sleep and activity on an endlessly scrolling horizontal plane, allowing you to quickly see your sleep and movement patterns in a detailed bar graph. Trends simplifies things a bit, compressing your sleep, movement or other info into day, week or month chunks. That makes it much easier to quickly spot patterns -- as the name of the pane implies. As the weather cools, are you moving about less? Are you getting your best night's sleep on Sundays and your worst on Fridays? And while the default options are total sleep and steps, you can break it down into time spent in a deep sleep or how much protein you consume. Finally, the Up app actually presents you with useful information presented in a useful way. While the simplistic progress bars and celebratory halo effect are still present for at-a-glance tracking, there's now a much deeper well of information to dig through. One of the most improved aspects of the Up app is its meal-tracking feature, which actually lets you monitor your caloric intake. Last year's Food Diary was just that -- a diary. You took a photo of your food, labeled where and when you ate it, and how it made you feel. It was less a way to actually quantify your nutrition than it was a poorly implemented FoodSpotting clone. 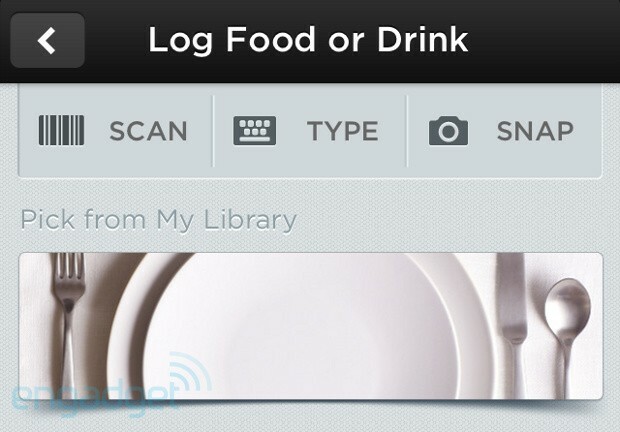 Thankfully that part of the app has been rebuilt from the ground up with a reasonably robust database of dishes and foods, and includes a barcode scanner for quickly compiling your intake with nothing more than your iPhone's camera. Unfortunately, there are still some rough edges. The ability to add header images based on food category seems superfluous. Not only that, but you can only add them as part of a generic food selection before you scan a barcode or search the database. Selecting sweet cereals under the breakfast heading doesn't actually filter out non-cereal items from your search and simply adds an extra step to the food-logging process. It may add a touch of style, but it's likely the sort of thing that might actually dissuade a person from monitoring their caloric intake. We also encountered several items that simply weren't in Jawbone's repositories. Our Midland Farms 1-percent milk returned an error and Trader Joe's vegetable samosas were incorrectly identified as organic ketchup -- despite existing in the database. The calorie-tracking element is greatly appreciated, but other services like MyPlate and FatSecret offer much more accurate and robust tools for those that want to manage the minutia of their nutrition and do so for free. Publicly tracking our meals did make us much more conscious of what we put in our bodies. Not that there was a ton of junk food in my diet, but the last remnants of it had been banished after just a couple of weeks of being forced to share my habits. Jawbone would say that the Up was simply making you aware and presenting you with hard-to-ignore data, but there's definitely a certain amount of shame involved. There are only so many times you can enter whiskey and Red Bull (never mixed, of course) before you start to assume your teammates are judging you. Perhaps the feature we were most excited about was Up's ability to track sleep patterns, something Fitbit has done for a couple of years now. The promise is that, with the aid of a special algorithm, the band will help you sleep better, wake up happier and nap more effectively. At the end of the night, you tell it you're going to sleep by pressing and holding the lone button until the Up vibrates and the tiny moon-shaped light glows. From that moment on the Up keeps extremely close tabs on your movement using actigraphy to tell when you've fallen asleep and whether you're in a deep REM stage or lightly snoozing. Beyond simply adding some variety to your daily bar graphs, monitoring the depth of your slumber is also key to the success of the Smart Alarm. Instead of making a loud noise at a predetermined time, the Smart Alarm gently vibrates when you're in a light sleep, somewhere around the time you'd like to wake up (up to 30 minutes before you've actually set it). In theory this should make you feel less groggy in the morning. Unfortunately, in practice, it was ineffective at best, and irritating, at worst. Over the course of several weeks the alarm only succeeded in waking me up three times. The rest of the mornings I was either awake before the Up or slept through its vibrations. The extension of the Smart Alarm is Power Nap. Press the button once, twice, then press it a third time and hold to tell the band you want to take a quick siesta. It then waits till you fall asleep then starts the timer, waiting for you to get roughly 26.5 minutes of shuteye, before rousing you during a light sleep cycle. My few experiments with this were rather unsuccessful, with the alarm once going off before I managed to get to sleep and another time failing to wake me up at all. Ultimately the issue seems to be that the Up isn't actually very good at telling when you're asleep and when you're not. And the fact that you have to manually tell it when it's bed time, unlike the Basis band, only exacerbates matters. One morning I forgot to take it out of sleep mode and the Smart Alarm went off 15 minutes after I got out of bed and was making a pot of coffee. Other days it was clear upon reviewing sleep data that the accelerometer inside just can't differentiate between laziness and actual sleep. Slothful Sundays that begin with a bed-bound TV session often translated into an extra bout of dozing in the Up app. There's a third alert, though it has nothing to do with the sleep-monitoring functions. The Idle Alarm reminds you to get up and move about every so often to keep your body from slowly atrophying at your desk. The band can be set to vibrate at certain intervals if you don't meet a movement quota. You can also set the hours in which this is active, so that the Up doesn't wake you every 30 minutes while you're trying to sleep. We appreciated the reminders to move (multiple editors strapped one on and set it to 45-minute intervals during the hours of 8 AM to 7 PM), but rarely did it ever actually motivate us to get up from our desks. It made us acutely aware of how sedentary we were during the day, but failed to actually make us do anything about it. The Up is very clearly targeted at those who wish to have a healthier lifestyle. And that term "healthy" is key. If you read through the various marketing materials you'll notice a few words that usually go hand in hand with "health" are missing -- most notably "fitness" and "exercise." The Up isn't for seriously athletic people, and one look at its activity-tracking feature makes that painfully obvious. The band itself can only act as a stopwatch to time your more active moments -- which you initiate by pressing the button once, then a second time and holding down until the green sun LED flashes and the bracelet vibrates. You mark the end of your activity by pressing and holding the button again. Next time you sync, an unknown activity will be added to your profile. If you're so inclined you could go in and specify the type of activity and the intensity level, which will give you a better estimate of your calories burned, but it still can't quite compare with something like a Garmin GPS combined with a heart rate monitor. In fact, it can't even come close to dedicated fitness-tracking services like Fitocracy or RunKeeper. Your activity choices are very limited -- there are only a grand total of 18 options, two of which are "video games" and "other." Future updates may make Insights more useful, but for now it offers little beyond fortune cookie wisdom and basic math. Mood tracking is another manually implemented feature that doesn't seem to add much for the data obsessed. Tap the smiley face icon on the home screen and you can set your status by sliding your finger up or down the screen. At the top is "amazing!" while at the bottom is "totally done," though you can customize the accompanying phrases for your avatar. Sure, you might notice you're in better mood when you sleep more or get more exercise, but overall it doesn't seem to add much depth -- it's just one more thing to keep track of. Sadly, what was billed as one Up's killer new features was also one its biggest disappointments. Jawbone describes Insights as a way to "discover hidden connections and patterns in your day-to-day activities." Instead it basically just spits out weekly recaps of how much you slept and walked along with generic, feel-good health advice like "staying active is a great way to beat the blues." Perhaps future updates will make Insights more useful, but for now it offers little beyond fortune cookie wisdom and some basic math. 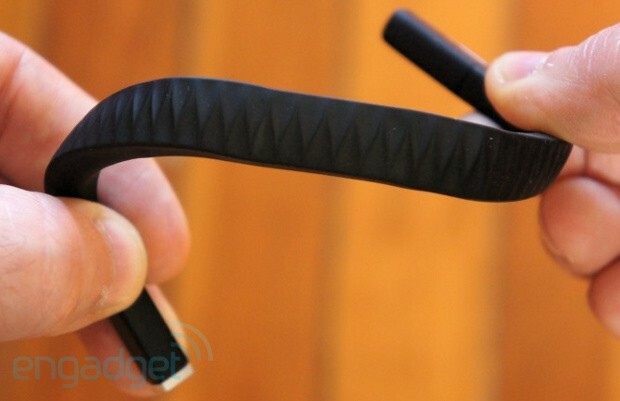 One year ago, we thought the Up was done for, but Jawbone refused to simply roll over and give up. We've got to give the company credit for going back to the drawing board, redesigning the band and its companion app and addressing all of the most glaring problems with the product -- most notably its tendency to stop working. This year's model is a success in terms of ruggedness and longevity. We're pretty sure we couldn't break this electronics-packed rubber band even if we wanted to and it can last well over a week on a single charge. So, if you were sold on the concept in 2011, but took issue with its durability, then rest assured your concerns have been addressed. On the software front, things are a little murkier. While the companion iOS app is certainly a significant upgrade, we still feel there's a lot of room for improvement. The design is slick; there are loads of new features; and you can dig much deeper into the details. The added granularity and new visualizations are clearly a highlight, but too many other features feel half-baked. It seems like Jawbone took the complaints about the stripped-down nature of the Up app to heart, but may have overcompensated by becoming a jack of all trades while mastering none. We will say this about the app: no longer does it seem like an afterthought. Instead we'd say it's the main attraction and the band seems like an accessory (an unfortunately mandatory one). And, therein lies the problem. 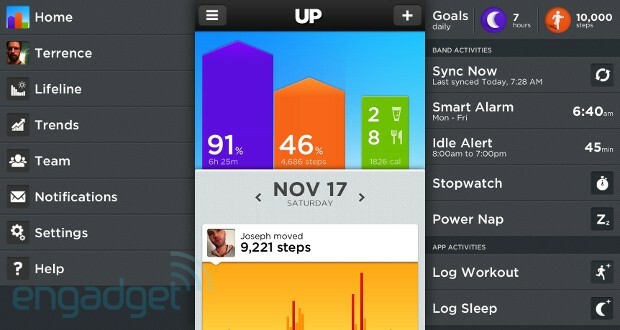 The Up band itself doesn't actually do much that you can't already do with your smartphone or a $20 pedometer. Heck, if you've got a phone running Jelly Bean, you've already got a pedometer. And, if you are in the market for a dedicated health tracking gadget, the Fitbit One offers most of the same features for $30 cheaper in a slightly less convenient form factor. If Jawbone would let you use the app without purchasing the bracelet, it might have more success luring people in by hooking people on the platform before trying to sell them a piece of jewelry. At the end of the day the Up excels at encouraging good habits and a healthy lifestyle, but considering the competition we're not sure $130 is a compelling price.